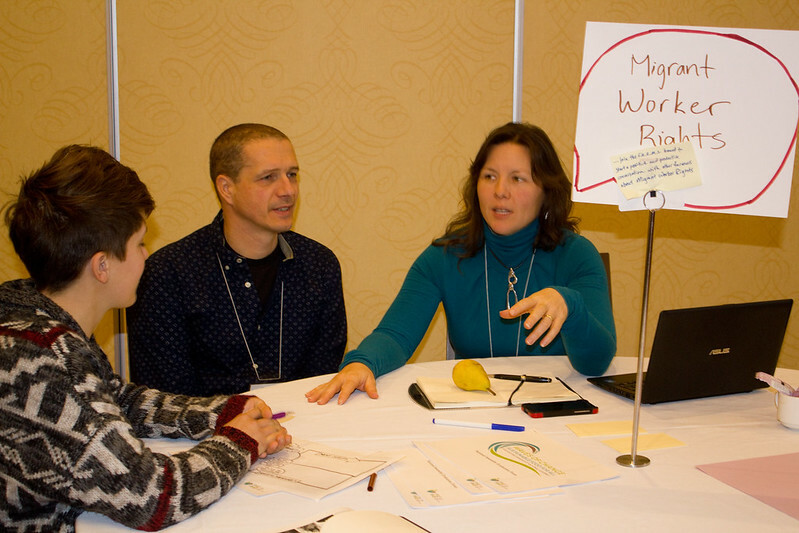 As part of Farm Worker Awareness Week (March 24-31st, 2015), this blog series highlights some of the ideas we have gathered over the past several months on promoting healthier, more sustainable farm worker livelihoods. Check out the bottom of this post for background detail on this community research partnership between Sustain Ontario and the University of Toronto. For many local food advocates, the topic of migrant farm workers is a touchy one. Ontario’s food movement has made great strides in acknowledging the importance of people who produce the food that nourishes so many eaters. However, if the struggles farmers face have been under-acknowledged, hired farm workers have been missing from the conversation even more so. Each season, over 20,000 migrant farm workers help to sustain Ontario’s orchards, greenhouses, nurseries, fields and packing stations. Most migrant farm workers come from Mexico and Jamaica through the federally administered Seasonal Agricultural Worker Program (SAWP). However, an increasing number of migrants come from countries like Thailand and Guatemala through non-SAWP agricultural streams of the Temporary Foreign Worker Program. Since 1966, migrant farm workers hired through the SAWP have made vital social and economic contributions to Ontario’s rural communities while sacrificing prolonged separation from their families and sending communities. In those communities, widespread unemployment and poverty arise from factors including trade liberalization (e.g. free trade agreements), structural adjustment programs, and the privatization of communal farmland and other local resources. Migrants seek a better life for themselves and their families by earning an income in Canada. However, they report encountering persistent language barriers, social isolation, structural disregard for their knowledge and skills, and few opportunities for community integration. In the case of Ontario’s food movement, migrants are rarely recognized on promotional materials for local food, don’t get invited to gourmet farm-to-table events, and aren’t represented on food policy organizations that make decisions on issues affecting farm workers’ lives. Why might this be this the case? Many locavores admit they feel uninformed about labour, immigration and human rights issues affecting farm workers. Volunteers and non-profit groups working on other critical food system issues like hunger and climate change explain they are stretched for funding and time, and they are unsure how farm labour aligns with their organizations’ goals. Some people point to sticky matters of race and class. They argue that disproportionate class and racial privilege in the food movement, coupled with an excessive focus on ‘shopping for social change’, have made it difficult to build relationships with farm workers who are categorized as non-white and non-Canadian. Supporting healthy working and living conditions for migrant farm workers isn’t as straightforward as ‘buying local’. Furthermore, migrant farm workers work long hours in rural areas that are geographically isolated from the urban nodes that catalyze many food movement efforts. Of course, Ontario farmers experience chronic challenges of their own. Whether small or large-scale, organic or not, export-oriented or targeting regional markets, many Ontario farmers are struggling with livelihood viability. It often seems like there is a mismatch between popular campaigns promoting Ontario farmers, on the one hand, and advocacy around equity for farm workers on the other. Even though farmers and farm workers are both squeezed by the prevailing economic logic of competition and profit, the interests of the two groups are framed as being now-and-for-always in conflict. However, many members of the Sustain Ontario alliance believe that people who are working toward a better food system have a remarkable capacity for practical and imaginative solutions. This was made beautifully clear, for example, in the grassroots creation of A People’s Food Policy for Canada, which includes policy recommendations for farm worker equity. There is nothing inevitable about a food system that pits the needs of farmers, farm workers, eaters and the land against one another. Collectively, we can work toward a food system that better meets everyone’s needs. With this in mind, since the autumn we have been conducting in-depth interviews with eleven people implicated in various aspects of migrant farm worker employment in Ontario. This has included people representing farmers and farm industry, health care, occupational safety, farm worker justice organizations, union labour, academia and the provincial government. We wanted to hear about the work they are doing, their challenges, and their ideas for actionable ways the food system can become more equitable for farmers and farm workers alike. While we ended up hearing more from people speaking to the migrant labour side of the equation, we invite further input from farmers and commodity groups. So far, we have not been able to speak directly with any migrant farm workers; we recognize this as a major limitation of our project. At the same time, it emblematizes the constraints around migrant farm workers’ capacity to participate in realizing a better food system. Sustain Ontario’s mission is to support food systems in Ontario that are “healthy, equitable, ecological and financially viable through collaborative action.” We recognize, however, that important gaps exist in improving equitability and financial viability for both farmers and hired farm workers, particularly for migrant farm workers. To that end, over the past several months Sustain Ontario has partnered with University of Toronto sociology doctoral student Anelyse Weiler on a service-learning project related to her research on migration, farm labour and food sovereignty. In light of the complexity of this issue, our aim is to highlight a range of perspectives in order to point toward possible actionable solutions that better meet the needs of all eaters, farmers and farm workers. We invite all readers to participate in this ongoing conversation by commenting on the blog post series, on Sustain Ontario’s Facebook page, tweeting @SustainOntario, or emailing anelyse.weiler@mail.utoronto.ca. 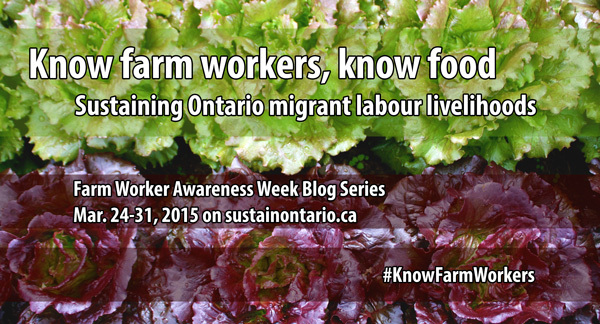 Feel free to use the hashtag #KnowFarmWorkers. Please share your thoughts in the short survey in the upcoming blogs.